(Ottawa, ON. 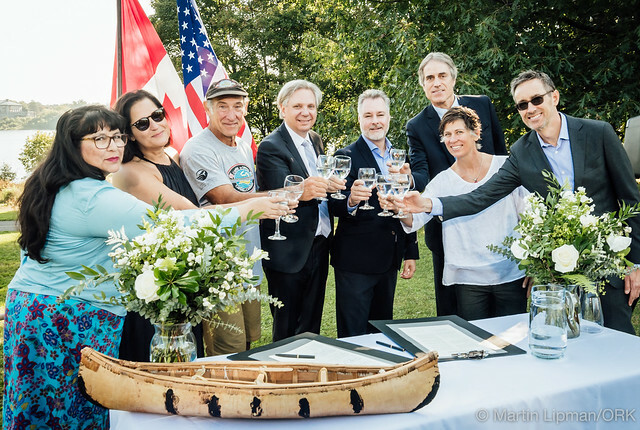 September 22, 2017) – Ottawa Riverkeeper (ORK) and Potomac Riverkeeper Network (PRK) are pleased to announce the symbolic twinning of the Capital Rivers of Canada and the United States of America, the Ottawa and Potomac Rivers, respectively. The announcement was made riverside this morning by the Riverkeeper organizations, in celebration of World Rivers Day (Sept. 24) and Canada’s 150th anniversary of Confederation. Ottawa Riverkeeper Meredith Brown and Phillip Musegaas, Vice-president for Potomac Riverkeeper Network, were both present, along with Mark Kristmanson, CEO of the National Capital Commission, and U.S. Embassy Acting Deputy Chief of Mission Stuart Dwyer. The twinning of our rivers is an initiative of Ottawa Riverkeeper and Potomac Riverkeeper Network. The Capital Rivers share some of the same characteristics and challenges: both are heritage rivers that provide drinking water to more than 5 million people each, including our nations’ politicians and decision-makers; one is inter-provincial and the other is inter-state, creating unique challenges for their governance; and they both present similar issues in terms of access to a swimmable, drinkable, fishable river. Ottawa Riverkeeper and Potomac Riverkeeper Network will work together to address these issues. Both organizations hope to increase public access to the rivers, as well as to increase awareness about the environmental, social, and economic roles of our Capital Rivers. ORK and PRK will also exchange experience, knowledge, and best practices to improve the governance of our Capital Rivers. Going forward, both Riverkeeper organizations will work toward fulfilling different twinning initiatives, including a series of educational videos about the rivers, workshops, public conferences, and field visits. Riverkeeper Network hope to foster an environment where cultural and technical exchanges across borders are not only facilitated, but actively sought out. The U.S. Mission to Canada provided grant support for the twinning initiative. Partner organizations are encouraged to sign the twinning declaration, and work together with their counterparts to further cement these cross-border ties. “On behalf of the National Capital Commission, chief steward of the Capital’s rich natural heritage, I commend Ottawa Riverkeeper/Sentinelle de la rivière des Outaouais and Potomac Riverkeeper for twinning the US and Canadian Capital Rivers and for their efforts to protect our historic waterways,” said Mark Kristmanson, CEO of the National Capital Commission. Our historical rivers are rich in history and have played a critical role in shaping our culturally unique communities. The Ottawa and the Potomac rivers have been formally recognized for their outstanding natural, cultural, and economic heritage. Recently, the Québec government designated the Ottawa River as a “lieu historique,” meaning all three levels of government – Ontario, Quebec, and Federal Canada, officially recognize the river’s heritage status. The twinning is also an opportunity to celebrate and appreciate that heritage. “The Ottawa and Potomac Rivers have played central roles for their respective capital cities, and for Indigenous Peoples who have lived on the land for millennia. From transportation to water supply to recreation, they have supported communities for generations and will continue to for generations to come. I applaud all the organizations that have made this symbolic twinning possible.” said Minister of Environment and Climate Change and Minister responsible for Parks Canada, Catherine McKenna. “The 150th anniversary of Confederation provides Canadians with the wonderful opportunity to become active in their communities and celebrate the rich history of their rivers. Communities across the country will take part in events that highlight the importance of preserving our precious natural resources for future generations,” said Minister of Canadian Heritage Mélanie Joly. PRKN VP of Litigation & Programs Phillip Musegaas and Ottawa Riverkeeper Meredith Brown combining waters from the Potomac and Ottawa rivers. At the Royal Canadian Geographical Society to celebrate the twinning of the Ottawa and Potomac rivers. In the photo: Geoff Green and Meredith Brown of Ottawa Riverkeeper, Canadian Geographic CEO John Geiger and Potomac Riverkeeper Network’s Phillip Musegaas.